After having lived in Oslo some 30 years, I never get used to coming back and being a tourist in what used to be my own hometown. I do like it, however. I used to walk thru the snow to work, pass one or two cozy cafes and dream about going in and sitting down and forgetting about the office. Now I can do just that! And this time Oslo was our hometown once again. It was cold when we came home, home to room 609 at the Raddison Park in the Oslo city centre. An average January day of ten below is not devastating to somebody used to living in Norway, but enough to make you notice. You notice the chill in your backbone when you go out without a scarf, and you notice that you miss the warm gloves that had by mistake been packed in the Bern lagerhaus instead of being brought on the trip up north. You also notice the lights of town. The lights are the fascinating parts of winter. The dark Nordic days are not about the darkness, they are about the light. The streets, the buildings, the neon signs when you are in the city, the shining sea, the moon and the stars when you are not. It can look like a drunken mess at times, but it can also be very beautiful. Room 609 was a nice little home to us. Enough space to store our belongings, a good view over Øvre Slottsgate in direction of Egertorget and Karl Johan, a useful breakfast and a not so scary rent. 1100 NOK (120 USD) per night for a double in Oslo is quite reasonable. And above all, 609 was a practical location when we wanted to spend a week meeting up with friends that we do our best to stay in touch with, despite the geographical distance that keeps us from seeing them as often as we would like to. 609 was our home # 4 since we left Bariswil. Home # 5 was compartment 85 in wagon # 12 on the night train from Oslo to Trondheim on the evening of January 22. It was the hardest of our new homes to find, some fool in Norwegian State Railway had given the sleeper-cars wrong numbers and we ran like idiots up and down the platform several times before we found out where to go. We told the conductor in no uncertain words what we thought of his company, and we are probably not on his Christmas card list for this year. Not his fault of course, but we were stressed, the train was due to leave, and we had to have a go at someone. He was the only one available, the poor sod. A real Northerner has of course no problems posing outdoors in his footballshirt in ten below! 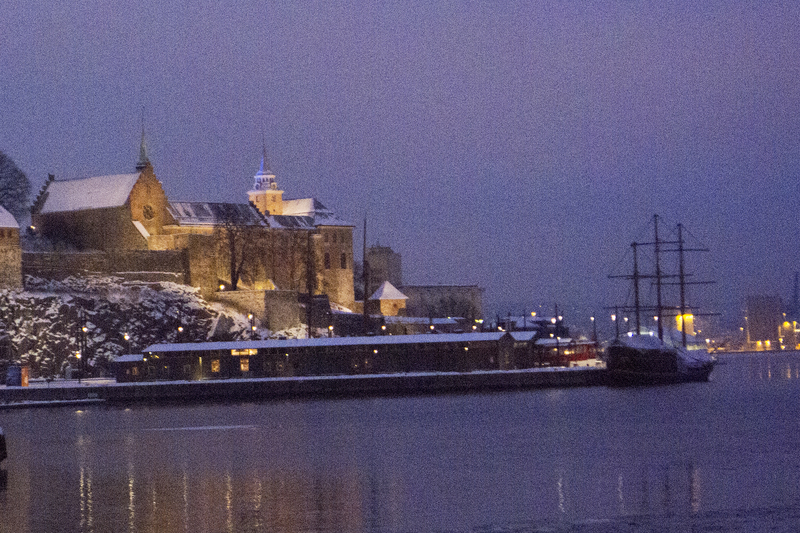 Taking a walk in the everlasting dusk of the wintery city of Oslo. All around the water tank, waiting for a train. Never had to sleep in the rain though!. Coach 12 in the disguise of coach 11. Caused us a good bit of stress and not-so-welcome running practise. Not the biggest of homes, but after having done the Trans Sibirian a tight night between Oslo and Trondheim is a peaceful easy feeling!